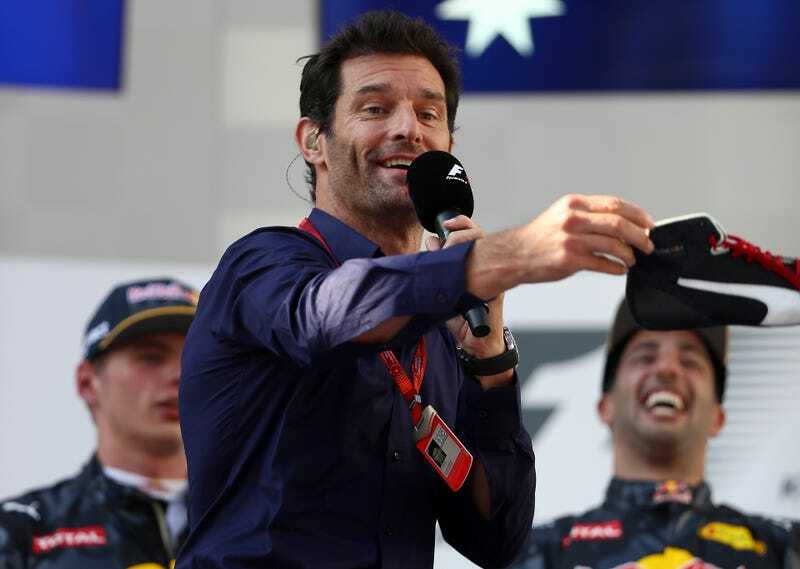 Mark Webber played along in Belgium, but he apparently learned his lesson about the “shoey”—a celebration done by drinking out of a shoe. 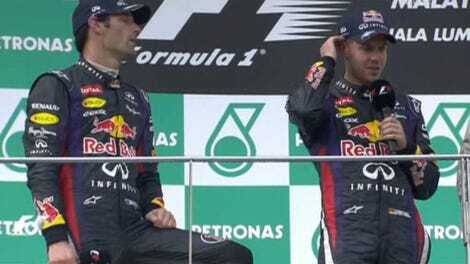 Winning Red Bull driver Daniel Ricciardo convinced several others on the Formula One Malaysian Grand Prix podium to do a shoey, but Mark’s reaction was the best. Teammate and second-place driver Max Verstappen, Red Bull team principal Christian Horner and third-place Mercedes driver Nico Rosberg all partook of Honey Badger brand shoe-pagne. Rosberg was a bit less excited about his swig. Ladies and gentleman, what a race! I thought they were going to have Multi 33 there at one point because it was tasty at the end. They’ve all earned their money today. It’s been a hot grand prix. And I’m not doing this! Ricciardo couldn’t be happier over his first win of 2016 and fourth-career F1 win, so he couldn’t quit smiling regardless. “Multi 33,” of course, refers to the “Multi 21” code Red Bull sent Webber and Sebastian Vettel’s way when they were driving for Red Bull here in 2013. 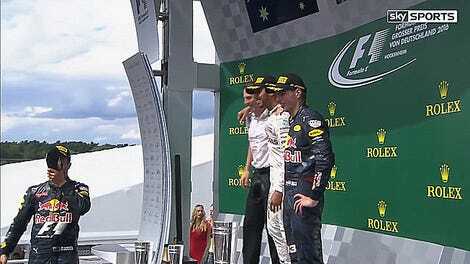 The “21” was the finishing order Red Bull wanted from their No. 1 and No. 2 cars that race—in other words, team orders to let a driver win—and that same style of coded message doesn’t quite work with the No. 3 and No. 33 of Ricciardo and Verstappen. Fortunately for us all, Red Bull didn’t do that this year and let their duo of drivers have at it in the most entertaining way possible. This was Red Bull’s first 1-2 finish since Brazil in 2013. Even I wanted to do a shoey with them this morning!